It's my pleasure to finally announce grizzly-sendfile v0.2 - the first stable version of a project that I started after I got one of those "Sudden Burst of Ideas" last summer. For people who follow the grizzly development or mediacast.sun.com, this is not exactly hot news. grizzly-sendfile has been used by mediacast since last September and mentioned on the grizzly mailing list several times since then, but I haven't had time to promote it and explain what it does and how it works, so here I go. If you don't care about my diary notes, skip down to "What is grizzly-sendfile". 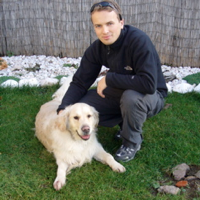 A bit of background: the whole story goes back to the end of 2007 when a bunch of us where finishing up the rewrite of mediacast.sun.com in JRuby on Rails. At that time we realized that one of the most painful parts of the rewrite would be implementing the file streaming functionality. Back then Rails was single-threaded (not any more, yay! ), so sending the data from rails was not an option. Fortunately, my then-colleague Peter, came up with an idea to use a servlet filter to intercept empty download responses from rails and stream the files from this filter. That did the trick for us, but it was a pretty ugly solution that was unreliable from time to time and was PITA to extend and maintain. At around this time, I learned about X-Sendfile - a not well known http header - that some webservers (e.g. apache and ligttpd) support. This header could be used to offload file transfers from an application to the web server. Rails supports it natively via the :x_sendfile option of send_file method. I started looking for the X-Sendfile support in GlassFish, which we have been using at mediacast, but it was missing. After some emails with glassfish and grizzly folks, mainly Jean-Francois, I learned that the core component of glassfish called grizzly could be extended via custom filters, which could implement this functionality. The idea stuck in my head for a few weeks. I looked up some info on grizzly and NIO and then during one overnight drive to San Diego, I designed grizzly-sendfile in my head. It took many nights and a few weekends to get it into reasonable shape and test it under load with some custom faban benchmarks that I had to write, but in late August I had version 0.1 and was able to "sell" it to Rama as a replacement of the servlet filter madness that we were using at mediacast. Except for a few initial bugs that showed up under some unusual circumstances, the 0.1 version was very stable. A few minor 0.1.x releases were followed by 0.2 version, which was installed on mediacast servers some time in November. Since then I've worked on docs and setting up the project at kenai.com. 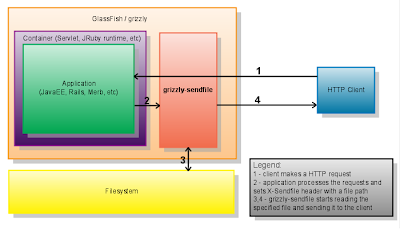 From the wiki: grizzly-sendfile is an extension for grizzly - a NIO framework that among other things powers GlassFish application server. The goal of this extension is to facilitate an efficient file transfer functionality, which would allow applications to delegate file transfers to the application server, while retaining control over which file to send, access control or any other application specific logic. By mixing some NIO "magic" and leveraging code of the hard working grizzly team, I was able to come up with an ARP (asynchronous request processing) filter for grizzly. This filter can be easily plugged in to grizzly (and glassfish v2) and will intercept all the responses that contain X-Sendfile header. The value of this header is the path of the file that the application that processed the request wants to send to the client. That's it, grizzly-sendfile will take care of the rest. There is a lot of stuff on my roadmap. Two of the main missing features are partial downloads and glassfish v3 (grizzly 1.9.x) support. Then there is better monitoring and tons of performance and scalability tuning, which I haven't really focus on yet. A lot of the API still needs to be polished and cleaned-up. Also needed is a solid test suite that is more fine grained than the system/integration tests that I created with faban. Yeah, go for it. This is my pet project that I developed in my free time. The project is licensed under GPL2, so you can even grab the code if you want. Sure. Code reviews, patches, suggestions and help with testing and documentation are more than welcome!